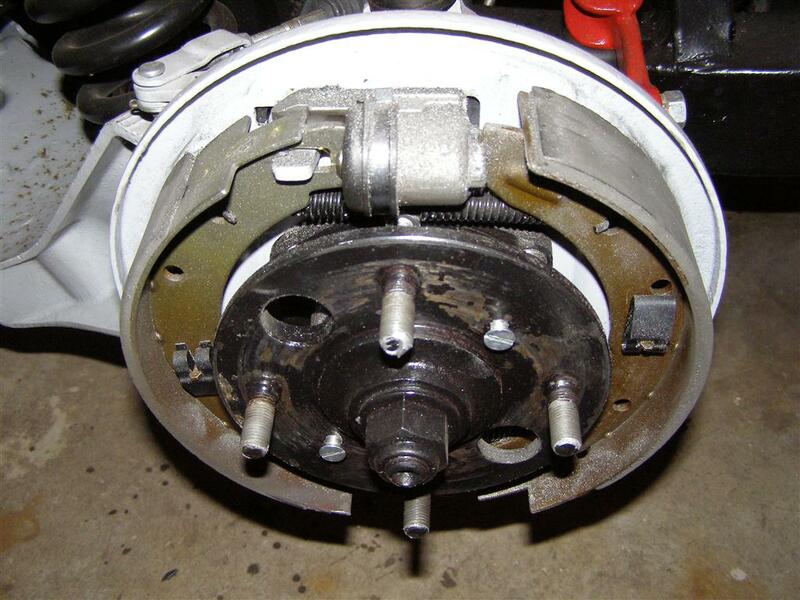 I have wanted to do this write-up since my frame was restored and the entire brake system was rebuilt in 2007.
and hard to get Alfin (aluminum finned) brake drum when the studs fell out of mine. I don't know if they have improved at all, but if you can save the original Girling units, you will better off, IMHO. This is the adjuster at the bottom of the backing plate, in it's place on my car after the frame and brake system restoration. You can see the two piston halves nearly touching as these are new brake shoes and there is no outward adjustment needed yet. That was the day before I took the car. These pictures below were 125 miles later. Notice the two "missing" studs? Luckily there was no real damage to the new aluminum drum, but you can see the aluminum shavings on the wheel cylinder and shoes. Not the best tapping job that I've ever seen. This is why I suggested saving your originals as described below. I've accumulated several old backing plates that had the original Girling wheel cylinders and adjusters intact. the nuts and then I put the plate in a vise and slowly and evenly applied pressure on the wrench to remove them. So once you get everything off, it's time to clean up the messy parts and take them all apart for rebuilding. For now, I'll focus on the adjusters and leave the wheel cylinders for another day. CLR and water mix starts to eat at the grease and rust that has accumulated on these parts over the past 35 years. 60/40 mix of CLR and water. Depending on your parts condition the time and mix ratio may need to be longer or weaker. MUST BE USED ALONG WITH ADEQUATE VENTILATION AND GOOD COMMON SENSE. As you could see above, the mix was rather dirty, so it was time to dispose of it responsibly and add the new mix. was lazy and wanted to see how long it took with a slightly stronger normal mix (rather than the normal 50/50 ratio). OK, so here we go. I cover these well, but do NOT seal the lid all the way, as it seems that the mix expands the air as it cleans. I was busy, so I didn't bother to look at these for 30 hours and I was pleasantly surprised when I peeked into the dirty solution. other crud that is hanging on, even after all of that chemical action. 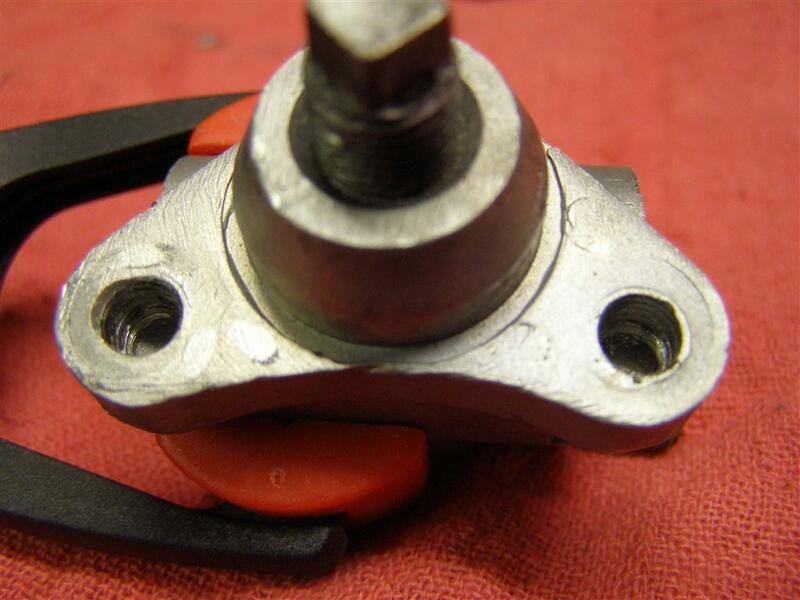 The wheel cylinders can wait for another time, so let's get started on the adjusters. 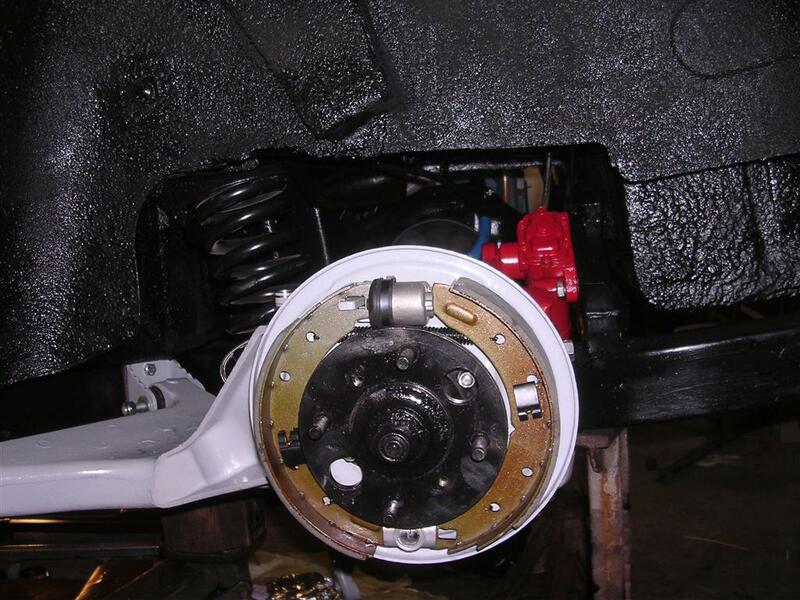 Disassembly is easy, IF the parts are not frozen up from rust, corrosion and old grease inside. The CLR will help get rid of most of it, but at times a soaking of a stubborn unit in Kroil (strong penetrating oil) is required. This guy needed another 10 hours of soaking before it would allow me to remove the pistons and screw out the adjuster bolt. 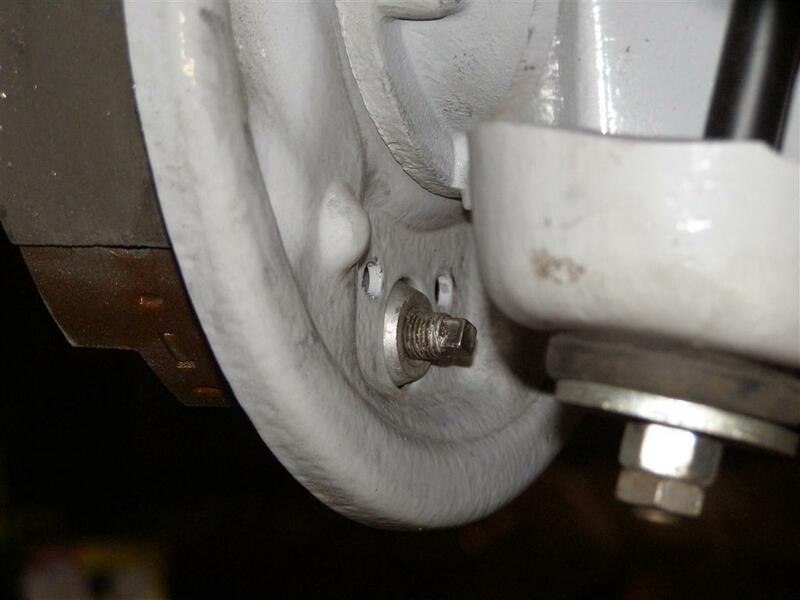 You first remove the pistons by pushing them out of the adjuster bolt by turning the back and forth until they come loose. The adjuster bolt is turned clockwise down into the bore of the cylinder and you use the octagon faced front edge to finish it out. 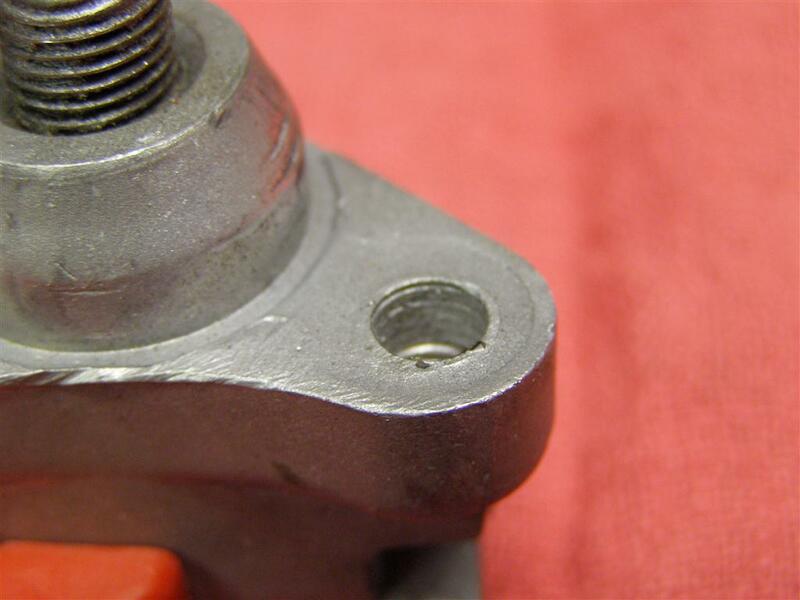 When the pistons and the adjuster bolt are out, you can see how it works and why they freeze up, but we have the cure for that. the piston faces to each sit on a flat surface as there are pushed further out in the bores to move the shoes closer to the drum face. Even though these soaked in the CLR/Water mix, I still additionally cleaned them with a brass brush wheel on my bench grinder. So here we go with the empty adjuster housing. I always tap the threads on parts like these to be sure the parts go back in easily. I run the tap through the back side first to the front and then from the front to the back to be sure it's all clean and working smoothly. That is a 3/8" X 24 Tap with a little CRC Cutting Oil on it, to bring out the chips if any are made and to make the threads smooth. And it looks like there was some crap in there. That screw was a little tight coming out, so this should help later. The next step is running it back through from the front side after removing that junk BEFORE winding the tap out the back. serviced at the time of every brake job, it may have lessened the build up of corrosion that leads to the locked up problems. Again, I am now using a 3/8" X 24 Die to clean up these threads with a little cutting oil. This will insure a good fit. A little blast with brake cleaner and some compressed air to clean everything out and we're ready to go back together. metals and if it has to come apart, you want it to be easy. But by doing so, this will allow it to work for more years that originally. The adjuster screw goes in first with a liberal amount on the threads. I use Q-Tips to spread it around and Nitrile gloves are good too. At a certain point you will not be able to turn this from the front, which is OK as the square end is now seen out of the back. The difficult time is taking these apart if the threads are dirty inside and you have those last few turns to go to get it out of the front. Just another view to show how it should look. This has to go down a lot further to allow the beveled pistons to fit in against the tip. You can also see that the inside of the bores are clean of all corrosion and build up. After all of these years, there will be stuff in there. OK, so this shows the other end, with the adjuster screw bottomed out to show the threads through the back. The mounting threads are cleaned and will get new SS washers and nuts and Anti-Seize as well. These are 1/4" X 28 Fine Thread. Before I get into assembling the pistons, this is a fairly good piston after soaking in a new batch of CLR mix for over 12 hours. It still needs a better cleaning on the wire brush to get is down to bare metal as shown below on the right. This is just for illustration, but you need to cover the entire surface and the bores of the housing. That is where the Q-Tips come in handy. This shows the proper alignment of the beveled edges to get them against the adjuster screw properly. more A/S after I looked at the picture and saw the ends were not completely covered. Again, the Q-Tip works well for touch up. so to keep things together a new elastic on each one does the trick of keeping them together until you are installing them. You can also see how far in the screw went, but that position will probably come back out with new shoes on the car. Lastly after some thread chasing on the mounting studs and some Anti-Seize, I installed new SS lock washers and 1/4" X 28 nuts. to run a bead of the Anti-Seize around the big raised area between the two studs where it fits into the backing plate. That is a rust on contact area and makes it hard to get them out. What could you do differently? I don't think much, except to add Nyloc nuts to the studs and that would probably be a help. fits the oil pan and differential plugs as well. It is bent to get into the adjusters easily and will make a nice addition to your tool box. It's a nice combination tool that does a good job which a regular open end wrench is not bent to do.